The sample indexes of lipemia, hemolysis and icterus are part of our chemistry results. They are provided automatically with our analyzer with any chemistry test and are very useful. These indexes are more objective and consistent than visual assessment of a sample. 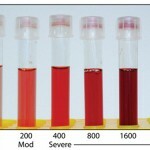 Hemolysis from ruptured red blood cells (whether in vitro as an artifact or in vivo, as part of an intravascular component to a hemolytic anemia), lipemia (due to increased chylomicrons and/or very low density lipoproteins) and icterus (from hyperbilirubinemia) in a sample can, in some cases, interfere with accurate measurement of clinical pathologic analytes through various mechanisms (for more, see interferences under test basics). Guides as to which tests are affected at different levels for each index are provided with the chemistry results from Cornell University. These are guidelines only (many are based on data from humans, particularly the product information sheet from the manufacturer, and may not be applicable to animals) and should be used carefully to assess the impact of these preanalytical variables (lipemia, hemolysis, icterus) on the chemistry results. When doing this, it is very important to interpret these values along with the clinical signs displayed by the patient and the remaining laboratory results, i.e. they should never be used alone. Remember that the effect of these interferences on chemistry results are also dependent on the analyzer and methods used. They cannot be transferred from one laboratory’s results to another. These guidelines are given below for each interference with the analyzer used in our laboratory (currently the Cobas 501). The guidelines below indicate how lipemia, based on the lipemia index, may affect results on our current chemistry analyzer. These guidelines are derived from manufacturer’s recommendations and are based on data from spiking human samples with Intralipid®. These values may not apply to samples from animals and there may be species differences. These guidelines should always be used in conjunction with clinical signs and knowledge of the underlying disease processes as guides for interpreting laboratory data and determining the accuracy of reported laboratory results. ≥100 Falsely increased: Direct bilirubin. Unknown effect with 5th generation reagents: Bile acids. ≥150 Falsely increased: Direct bilirubin. Falsely decreased: sodium, potassium (less affected than sodium and chloride), chloride (if triglyceride concentrations are high, e.g. > 600 mg/dL). Unknown if increased or decreased: ALT, AST, bile acids. ≥300 Falsely increased: Direct bilirubin, TIBC. ≥500 Falsely increased: Direct bilirubin, TIBC. Unknown if increased or decreased: Albumin, ALT, AST, bile acids. ≥1000 Falsely increased: Direct bilirubin, TIBC. Unknown if increased or decreased: Albumin, ALT, AST, bile acids, calcium, cholinesterase, CK, glucose, phosphate, urea nitrogen. ≥1500 Falsely increased: Direct bilirubin, TIBC. Falsely decreased: Bicarbonate, sodium, potassium (less affected than sodium and chloride), chloride (if triglyceride concentrations are high, e.g. > 600 mg/dL). Unknown if increased or decreased: Albumin, ALT, AST, bile acids, calcium, cholinesterase, CK, fructosamine, glucose, phosphate, total bilirubin and urea nitrogen. Effect on other analytes: Unknown. The number reported under Hemolysis on our chemistry panels is a semi-quantitative measurement of the concentration of free hemoglobin in mg/dL. The image to the right shows a visual representation of how these values correspond to visible hemolysis in plasma samples and the table below correlates the index value to this gross appearance. Free hemoglobin in the sample has little or no effect on most assays unless the level is very high (>300 hemolytic index). The guidelines below indicate how hemolysis (rupturing of RBCs) may affect sample results from our current chemistry analyzer. These guidelines are derived from manufacturer’s recommendations and is based on data from spiking human samples with hemoglobin. These values may not apply to samples from animals and there are important species differences (for example, a high potassium is expected in hemolyzed samples from horses, camelids, pigs and sheep because potassium concentrations in the erythrocytes of these species are higher than in serum – this is not true for most breeds of dogs, other than Asian breeds, or several breeds of cattle). These guidelines should always be used in conjunction with clinical signs and knowledge of the underlying disease processes as guides for interpreting laboratory data and determining the accuracy of reported laboratory results. Species-dependent changes have been published, however these will always be method- and analyzer-dependent and are not broadly applicable to results. For more on species-dependent changes, refer to the interference section of test basics. ≥40 Release of RBC constituents (false increase): LDH (in dogs, in our experience), TIBC. Unknown if increased or decreased: Fructosamine. ≥300 Release of RBC constituents (false increase): AST, iron, LDH (in dogs, in our experience), TIBC, potassium (species-dependent – horses, camelids, cats and some ruminant breeds), CK (constituents in red blood cell membranes participate in the CK reaction). ≥500 Release of RBC constituents (false increase): AST, iron, LDH (in dogs, in our experience), TIBC, potassium (species-dependent – horses, camelids, cats and some ruminant breeds), CK (constituents in red blood cell membranes participate in the CK reaction). False increase: Phosphate, total protein. False decrease: Amylase, direct bilirubin, GGT, NEFA (by an average of 0.05 mEq/L, range of 0.03 to 0.07 mEq/L). ≥600 Release of RBC constituents (false increase): AST, iron, LDH (in dogs, in our experience), TIBC, potassium (species-dependent – horses, camelids, cats and some ruminant breeds), CK (constituents in red blood cell membranes participate in the CK reaction). False decrease: Amylase, bicarbonate, direct bilirubin, GGT, NEFA (by an average of 0.05 mEq/L, range of 0.03 to 0.07 mEq/L). ≥700 Release of RBC constituents (false increase): AST, iron, LDH (in dogs, in our experience), TIBC, potassium (species-dependent – horses, camelids, cats and some ruminant breeds), CK (constituents in red blood cell membranes participate in the CK reaction). False increase: Cholesterol, cholinesterase, phosphate, total protein, triglycerides. ≥800 Release of RBC constituents (false increase): AST, iron, LDH (in dogs, in our experience), magnesium, TIBC, potassium (species-dependent – horses, camelids, cats and some ruminant breeds), CK (constituents in red blood cell membranes participate in the CK reaction). Unknown if increased or decreased: Creatinine, fructosamine, total bilirubin. ≥1000 Release of RBC constituents (false increase): AST, iron, LDH (in dogs, in our experience), magnesium, TIBC, potassium (species-dependent – horses, camelids, cats and some ruminant breeds), CK (constituents in red blood cell membranes participate in the CK reaction). The number reported under icterus is an estimation of the total bilirubin concentration in mg/dL rounded to the nearest whole number. Underfilling of heparin anticoagulant tubes: If heparin (green top) anticoagulant tubes are <3/4 full with blood, a falsely increased total bilirubin (mostly indirect bilirubin) may be seen. Species that normally have lightly colored serum (e.g. birds, ruminants): Carotenoids in the diet (and serum) will contribute to the icteric index (but not the total bilirubin value). The guidelines below indicate on how tests are affected by icterus with our chemistry analyzer. These guidelines are derived from manufacturer’s recommendations and is based on data from spiking human samples with conjugated or unconjugated bilirubin. These values may not apply to samples from animals and there may be species differences. These guidelines should always be used in conjunction with clinical signs and knowledge of the underlying disease processes as guides for interpreting laboratory data and determining the accuracy of reported laboratory results. ≥6 Unknown if increased or decreased: Fructosamine. ≥11 Falsely decreased: Total protein (Garner et al 2014, Gupta & Stockham 2014), triglycerides. ≥16 Falsely decreased: Cholesterol, creatinine, total protein, triglycerides. ≥20 Falsely decreased: Cholesterol, creatinine, GGT, total protein, triglycerides. ≥40 Falsely decreased: Cholesterol, creatinine, GGT, total protein, triglycerides, uric acid. Unknown if increased or decreased: Fructosamine, phosphate. ≥50 Falsely decreased: Cholesterol, creatinine, GGT, lipase, total protein, triglycerides, uric acid. Unknown if increased or decreased: Direct bilirubin, fructosamine, phosphate. ≥60 Falsely decreased: Cholesterol, creatinine, GGT, total protein, triglycerides, uric acid.